Indian Coast Guard Recruitment 2017- Navik (Domestic Branch) (Cook & Steward): Last Date 09-06-2017. - Jobs4NE : Jobs in Assam and North East India. Indian Coast Guard Recruitment 2017- Navik (Domestic Branch) (Cook & Steward): Last Date 09-06-2017. Indian Coast Guard invites Application from interested and eligible Indian candidates for the post of Navik (Domestic Branch) (Cook & Steward) For 02/2017 Batch, Course Commencing from October, 2017. Starting Date of Online Application: 03-06-2017. Last Date of Online Application: 09-06-2017. Name of the Post: Navik (Domestic Branch) (Cook & Steward). Qualification: Class 10th passed with 50% marks from recognized by Central/ State Government a board/ institution. Age Limit: As on 01-10-2017, Minimum 18 years & Maximum 22 years of age. Scale of Pay: Please download advertisement details. Selection Process: Selection will be made based on written test/ interview. 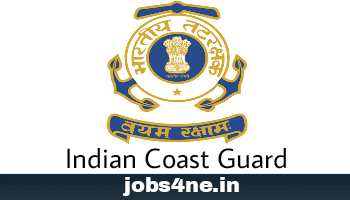 How to Apply: Interested and eligible candidates may apply Online through the official website: http://www.joinindiancoastguard.gov.in by uploading all essential documents and photograph.